The BOSS Nextone Artist 80-Watt Guitar Amplifier Combo gives you all the power and tone shaping versatility that a gigging or recoding guitarist could desire. With a plethora of front panel controls at your disposal, a wide range of connectivity options and superb tones at the ready, you'd be happy enough with that. 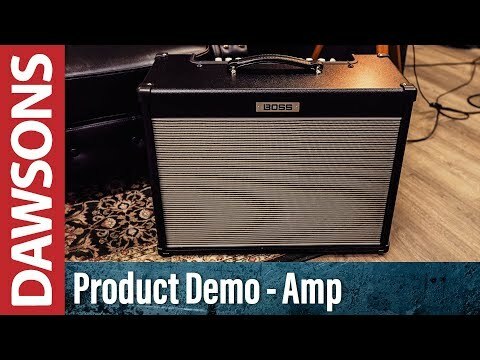 But once you dive deeper into the amp's setting with BOSS' Nextone Editor software, you unlock a whole universe of tone sculpting potential that opens up limitless possibilities. The BOSS Nextone Artist amp is endowed with bleeding-edge Tube Logic technology, which dutifully reproduces the complex character of a tube amp with unwavering attention to detail. The benefits are severalfold as you get all the tasty tones of tube powered amps with having to treat them like the delicate flowers that they are. There's no maintenance required, you won't break your back carrying one, and you have multiple amp types to choose from rather than just the one. The selection of power amp types available include: 6V6, 6L6, EL84, and EL34, giving you everything from old school '60s British combos to modern day American powerhouses. The Artist features a dual-channel design with clean and lead channels to choose from, with the lead channel boasting independent Gain and Volume knobs. The global three-band EQ allows bass, middle, and treble to be adjusted to suit and musical style. Direct control over the built-in delay and reverb effects are afforded, as are access to the presence control, a master level knob, power amp select switch and a power control switch. The power control switch allows you to set the output power at maximum, half power, 0.5-Watts or standby. The beauty of this is that you can achieve the same rich tonal saturation at much lower output levels, making the Nextone Artist ideal for recording, jamming, practising at home, small/medium/large gigs (pretty much anything and everything). There's even a headphone output for times when you want to shut the world out and noodle away into the wee hours. Amongst the many connectivity options available on the Nextone Artist you'll find USB. Not only does this little gem make it a doddle to record directly to your DAW - with multi-channel support for stress-free re-amping - but it allows you to connect to the Nextone Editor. This is where the Nextone Stage comes into its own. Not only do you have access to four Class AB analogue power amp types as discussed above, but the Nextone Editor gives you the ability to tinker and tweak everything from bias and sag to EQ and FX, change the Tone switch assignment, and even assign the Boost button as a compressor instead. You can tailor the amp to meet your personal tastes with a level of flexibility that is nothing short of astonishing. Thanks to 99 different user setups you can get your pre-gig prep tone sorted and saved for later recall. The BOSS Nextone Artist plays well with the optional GA-FC foot controller, which affords hands-free command over channel selection, Tone, Boost, effects, pedal volume, and so much more. The line out allows you to connect directly to PA and using the Nextone Editor one of three "Air Feel" settings enables you to choose from a range of mic'd cab tones. To be heard on even larger Artists, external speaker jacks are included for connecting up to two 16-Ohm 4 x 12 cabs for a monster wall of sound. Though the Nextone Artist boasts built-in delay, reverb and tremolo effects, the Nextone Editor takes things a step further by allowing you to dictate what type of delay or tremolo effect is in use such as analogue, tape or SDE-3000. The reverb can also be changed between plate, spring or hall types to suit your performance environment or playing style. As if all that wasn't enough, there's even a loop for integrating outboard effects and further editing within the Nextone Editor. Simply put, the BOSS Nextone Artist 80-Watt Guitar Amplifier Combo not only makes your gigging life easier, but it makes it better too.